Carson Wentz’s quick acclimation to the NFL is widely credited for the Eagles’ 4-2 start. Wentz has indeed been excellent. 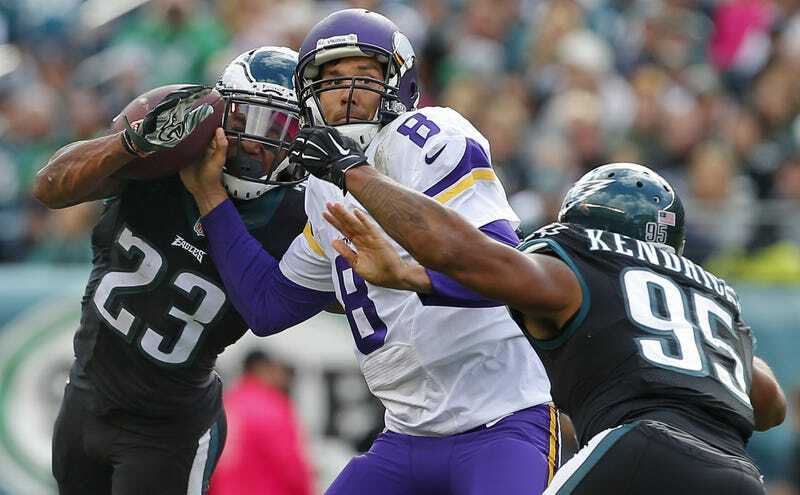 But Philly’s defense—and especially its defensive line—has been fantastic through six games, and it deserves its due. Through seven weeks, the Eagles lead the league in DVOA and in adjusted sack rate, and it’s a triumph for a scheme that until this season had been a profanity in the Delaware Valley. Not anymore. New head coach Doug Pederson has given defensive coordinator Jim Schwartz complete control of the defense. Schwartz switched the Eagles from a 3-4 to a 4-3, and he installed a system that includes the “Wide Nine,” a technique that positions an end outside the tackle, with no responsibility except to go balls-out after the quarterback. The end of Andy Reid’s tenure in Philly was marked by the renowned failure of the “Wide Nine,” but internal dysfunction had set in by then, and the personnel is very different now. Schwartz, after a year off from coaching (he reportedly declined the chance to become D coordinator in Miami in midseason), laid the foundation for this season by astutely assessing what he inherited in Philadelphia, and by bringing in a pair of free agents (outside linebacker Nigel Bradham, cornerback Leodis McKelvin) from his lone season as the Bills’ coordinator in 2014. What he’s built has been sparkling: The Eagles are a unit that functions from front to back, but it all begins with an outstanding D-line that can bring can bring pressure without having to blitz much. In fact, the Eagles have blitzed on just 19.6 percent of all dropbacks, well below the league average of 30.5 percent, according to Pro Football Focus. And that, in turn, has made those occasions when Philly does bring extra pass rushers that much more effective. Schwartz immediately recognized he had a pure pass rusher in DE Brandon Graham, who had been somewhat miscast in recent years as an outside linebacker (with all its attendant edge-setting duties in the run game). Graham was around for the “Wide Nine” disaster of 2012, but that was also the year in which Reid, so desperate to win a Super Bowl, bizarrely tapped Juan Castillo, his longtime offensive line coach, to coach the defense. And Castillo was undermined at every turn by defensive line coach Jim Washburn, who took his insubordination so far as to call Castillo “Juanita” in front of his players. Neither Castillo nor Washburn survived that season, and Reid was a dead man walking. The coaching situation in Philly is far more stable these days, and the personnel is far better suited for “Wide Nine” than it was four years ago. “Wide Nine” makes the defensive linemen responsible for attacking one gap, which forces the linebackers and safeties to make plays in the run game. As Tim McManus pointed out over the summer for Philadelphia magazine, the ‘12 Eagles had a linebacking corps of Casey Matthews, Moise Fokou, and Jamar Chaney that was not suited to handle that kind of burden. But the current group, which includes Mychal Kendricks and Jordan Hicks, plus the newly acquired Bradham, is a much better fit for the scheme. The same is true of current safeties Malcolm Jenkins and Rodney McLeod vs. the 2012 tandem of Nate Allen and Kurt Coleman. Hicks, a 2015 third-round pick, is one of just three remaining players Chip Kelly brought in, either through the draft or via free agency. He stuck because he has the ability to play either sideline-to-sideline or to shoot gaps behind an aggressive front. Kendricks, anticipating he’d have to challenge offensive linemen blocking him more often on the second level, prepared for the change by bulking up 15 pounds. “We may see more people in our face, which means we would have to be more physical, and I’m all for it,” Kendricks said back in May. McLeod, who came over from the Rams in free agency, is a bit smaller than Jenkins, who signed a lucrative extension during the offseason. But according to Schwartz, both possess multi-dimensional skills as blitzers, tacklers, and cover guys. And both get used interchangeably. It’s not just Graham. 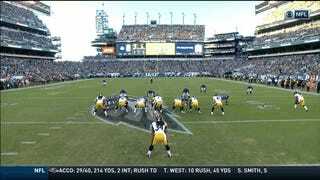 Wentz caught everyone’s attention with his Week 3 masterclass against the Steelers, but the Eagles’ front four spent the entire afternoon eating and making life miserable for Ben Roethlisberger. The Eagles used a lot of double coverage on Antonio Brown, and their safeties did a lot to keep Roethlisberger from doing much of anything to beat them deep. But what was astonishing—and what turned that game into a rout—was how often the Eagles got to Roethlisberger with just a four-man rush. 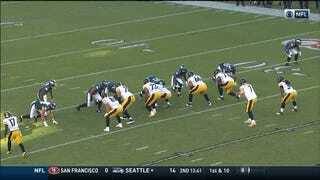 And here’s defensive tackle Fletcher Cox treating DeCastro like a blocking sled and forcing a strip-sack. Cox, per PFF, ranks fifth among 4-3 D-tackles with a pass rushing productivity rating of 10.4. That play was one of the specific wrinkles the Eagles installed because of their familiarity with Bradford, who was traded to Minnesota just days before the regular season started. 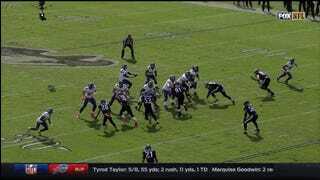 The Vikings had two tight ends lined up to the right side of the formation, but the Eagles took Bradford’s hot read away by dropping Graham (No. 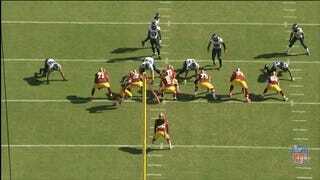 55 at the top) into coverage as the pressure came from the weak side. Schwartz told reporters during the offseason he had developed a feel for adjusting his scheme to his personnel during his time as the Titans’ defensive coordinator during the aughts—the gig that propelled him to become the head coach of the Lions, where he took a winless team to the playoffs in a matter of three seasons before everything went to pot. The Eagles’ schedule gets daunting in the weeks ahead, with road tests at the Cowboys, Giants, and Seahawks sandwiched around a home game against the Falcons. Dallas, with Ezekiel Elliott pounding the ball and Dak Prescott efficiently manning the controls behind arguably the best O-line in the league, ought to be Philly’s biggest test to date. But for now, Schwartz and his unit seem to have hit on a winning formula.